A cold storage warehouse in Washington was destroyed because it wasn’t up to code with fire sprinklers. Understand the fire protection required for cold storage facilities and the maintenance that keeps them working effectively. The Kansas City warehouse industry is booming. Find out how these warehouses are being protected from fire. Whether automated, cold storage, high-stacked, or in between, warehouse fire sprinklers deserve a customer design to protect its assets. Video: F.E. Moran Fire Protection Sprinklered a Warehouse Complex the Size of 153 Football Fields! Warehouse fire protection is important with the hazards of high ceilings with high stacks of materials, automation, and more. Check out the video of our giant warehouse complex fire sprinkler project in Kansas City, KS. Learn how fire protection needs to be adjusted when products begin being stored 45+ feet in the air in warehouses. Warehouse Fire Risks: What are the hazards? Automated warehouses are the future of the industry. Robots pull products from open plastic bins, blocking fire sprinklers from doing their job. When that product bin catches fire, how will the fire sprinkler work? 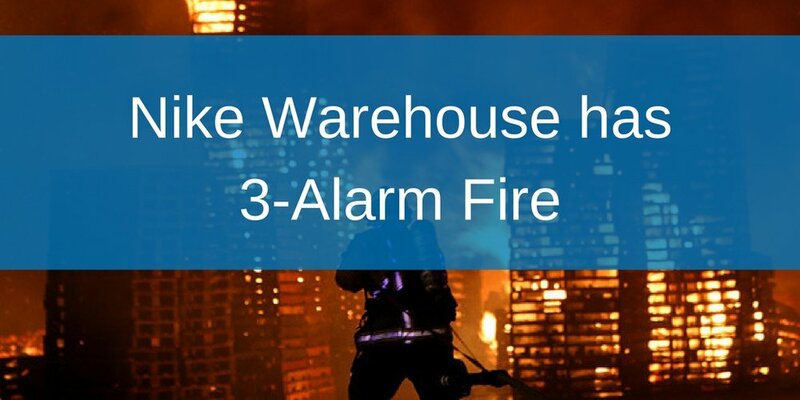 Warehouse managers and risk managers - read this to learn the new way fire protection needs to be designed for automated warehouses. Portland, OR -- A 3-alarm fire broke out at the Nike campus, bringing 65 firefighters from 3 different fire departments. The Tualatin Valley Fire & Rescue sent out a press release, saying that no one was injured in the three-alarm fire. The fire started in the Beaverton warehouse at 3:30pm on Monday, January 22. When firefighters arrived, fire was venting from the sides of the roll-up doors. The building was 25,000 square feet according to LT Ryan Stenhouse. The fire was mainly in the middle of the warehouse. The crews worked the fire for 40 minutes before calling a 2-alarm fire and then a 3-alarm fire. It took a full hour for firefighters to search the warehouse because of all the materials on fire. Firefighters were able to confirm that no one was inside when the fire broke out. The news release said that the warehouse had fire alarms, but it is unknown if there were fire sprinklers. Subscribe to our blog: Get it in your inbox! The United States has more than 600,000 warehouses with an average of 17,400 square feet. As business grows, the warehouse must grow with it. Expanding the footprint of the building to accommodate a growing business is far more expensive than building up. However, when a warehouse expands in height, fire protection becomes an issue. In-rack sprinklers or ceiling fire sprinklers need to be able to reach wherever the fire is, and if pallets are stacked too high, they will inhibit the spray. According to the National Fire Protection Association (NFPA), fire sprinkler regulations are being explored. Changes in firefighting strategy, limitations in water supply, and the increase in warehouse size provoked the Fire Protection Research Foundation to investigate new fire protection options. They looked at fire detection for early fire warning, fire location identification and monitoring in warehouses, benefits of quicker suppression systems, reducing water supply requirements, and minimizing the involvement of fire departments. When we bring higher ceiling heights into the mix, fire sprinklers get even more complicated. However, with the evolution of warehouse expansion, fire protection has evolved as well and provided a less expensive way for warehouses to expand. In the 1970s, real estate was cheap and warehouses and storage facilities were growing in necessity. This was also the time that fire protection became more standardized. Warehouses were averaging a ceiling height of 18-25 feet and pallets were stacked high. In-rack fire sprinklers were necessary to protect the space and commodities. Although, they were also extremely unpopular because forklifts would hit them and water would spray; additionally, whenever a rack was moved, the piping needed to be changed. In the early 1980s, drop fire sprinklers were developed by FM Global at their full scale fire testing facility. The drop sprinklers in combination with roof-only sprinklers allowed for buildings with heights of up to thirty feet to be protected without the need for in-rack sprinklers. The large drop sprinklers used large droplets to overcome the fire instead of a fine spray. The drop sprinklers were an early version of the modern day Early Suppression Fast Response sprinklers (ESFR). The ESFR sprinklers used a fast response and high velocity method. The head faced downward, unlike its predecessor. This sprinkler is expected to not just control a fire, but extinguish it. They are used exclusively in heated warehouses. For more information on cold storage warehouses click here. In the late 1980s, ESFR sprinklers were listed for buildings up to 30 feet, but as warehouses began to expand, so did the ESFR sprinklers' reach. Eventually the sprinklers evolved to 40-45 feet and now can work for up to 48 feet ceiling heights, with some restrictions. With the right amount of water pressure (166-169 gallons per minute), ESFR sprinklers can work with ceiling heights up to 48 feet. This allows for warehouses to hold more commodities without having to expand its footprint. For warehouses that use FM Global as their AHJ, ceiling heights can be over 45 feet with the addition of in-rack fire sprinklers. However, in order to protect a storage facility with ceiling heights over 45 feet, a variety of discharge requirements need to be followed such as restrictions on aerosols, rubber tires, and expanded plastics. 1. When building up, will you need stronger floors? 2. Will you need to level the floor to keep equipment even? 3. Will the fire protection equipment be more expensive? 4. Will costlier heads, larger piping, larger pumps, larger water supplies, or extra storage tanks be necessary? If it is time to expand a warehouse, make an informed decision about whether the warehouse should be built up or expanded out. Contact an architect and fire protection contractor before making a final decision to determine the best course of action.